property description: Pollywogg Hollër is the birth of a dream that started back in 1976 when Barb and Bill Castle entered this enchanted forest with their three young children, a bunch of hand tools, and a vision to establish a home site and life style that would be in harmony with nature - a reprieve from our hectic modern life. After opening our doors as an Eco-Resort in 86', we owe our continual growth and thanks to the constant flow of adventurous guests that discover our path each day. We continue to grow in love as a family business and invite all that are interested to come and share this love at Pollywogg Hollër. The work of over one hundred artists - many from the world-renowned New York State College of Ceramics at Alfred - is displayed along the wooded trails that encompass the camp. Here, you may stroll undisturbed through towering figures that pop with color and contrast. Fern covered knolls cushion glass ornaments. Pottery encrusted with moss sprouts from the earthy surroundings. 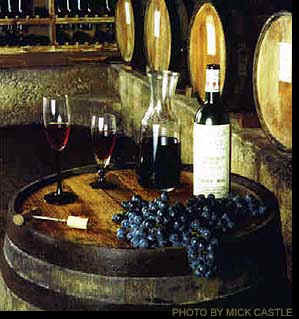 Don't miss taking a tour of the wine cellar where perhaps you will catch a glimpse of the wine making. Wine tours are always festive (whether you partake or not) and tailored to your special preferences. An informative tasting session will enable you to select the perfect wine to compliment your awaiting dinner. 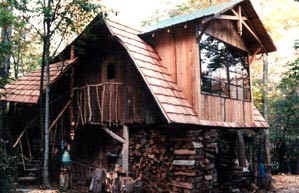 A rustic loft and private bedchamber accompany the main building - a solar-powered log cabin. A sheltered porch provides the perfect balcony for dreaming, reading or simply gazing at the enchanted view. 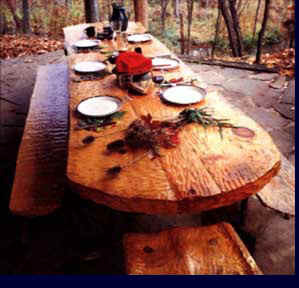 Timber, stone, stained glass, sky lights, delightful wood carvings, and Adirondack-style furnishings adorn every corner. Gravity-fed spring water, lantern light, and wood-burning stoves create a cozy atmosphere that is harmonious with the nature surrounding it. A Pine-fired Finnish-style family sauna warms a private sleeping loft just above it. Hand-carved wood, stained glass, and a pulley- hoisted spring water barrel shower rests in the soft glow of lantern light. 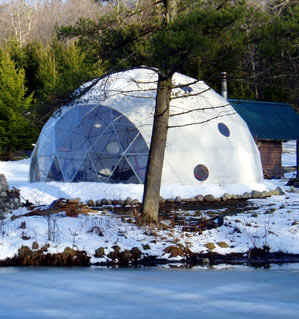 An adjoining balcony and a circular skylight allows for romantic stargazing. 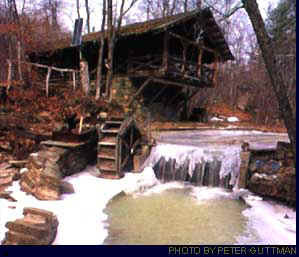 This charming timber-framed structure was constructed with logs naturally felled during the great ice storm of 1991. A twisted, troll- like staircase leads to a private and spacious bedchamber atop a woodworking and carving shop. Carved tree trunks decorate the room. Oversized windows welcome a breathtaking view of sky and forest. The Wood Loft is perfect for intimate group and family accommodations. This quaint, private cottage is just large enough to hold a pillowy-soft bed for two. A miniature wood-burning stove creates a cozy atmosphere. Surrender to romance as the uninterrupted, melodic rush of a flowing stream carries away the tensions of reality. Overlooking the enchanted valley of Pollywogg Holler, stands the stately old one room School House No. 4. Built before the Civil War and previous to Lincoln becoming president, it served as a school house for over 100 consecutive years. In the early 1950's the school district was dissolved and School House No.4 fell into private hands. Fortunately the new owners had a fond respect for the building and maintained it to its original condition just as it had been since it's first construction in 1849.
area attractions: Each season has it's own special attraction in the New York State Park Areas of Allegany County and surrounding Southern Tier of Western New York. Skiing, hiking, biking and horse trails are some of the options available. The following list of places are worth considering if you are planning some group or family activities in the area while you stay with us. Over 20 km of cross country trails in the midst of 46,000 acres of New York State forest in Allegany County. Letchworth State Park, Stoneybrook State Park and Allegany State Parks are all within a short driving distance. The world-renowned New York State College of Ceramics at Alfred, which houses the International ceramic Museum, is only six miles away. Includes family style brick oven dinner, your choice of lodging accommodations, and breakfast. Includes an informative wine tasting session that will enable you to select the correct wine to compliment your awaiting dinner; individual gormet brick oven dinners - prepared "old world style" with just the right hint of wood smoke flavor; wood-fired Finnish-style sauna; your choice of lodging accommodations; and breakfast. Get your friends together and be the only ones at Pollywogg Hollër - up to 10 people. Includes brick oven dinners, unlimited use of the wood-fired sauna, all available lodging accommodations, and a buffet-style breakfast.